(2005-2006) Self funded emergency-relief project – Nalamdana’s Nambikkai (Hope) Project for post tsunami rehabilitation was undertaken by the Trust using our own funds. The 18 minute documentary focuses on post tsunami rehabilitation issues addressed through innovative popular theatre. Our approach was to create an informative yet entertaining play developed and performed by Nalamdana’s drama and counseling team. 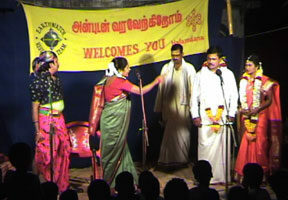 Between May and September 2005, Nalamdana performed the play in more than 30 cities, towns and villages on the coast of Tamil Nadu, India, reaching thousands of displaced people.